Palazzo Ducale, Doge’s Palace is located in Piazza San Marco, right in front of the San Marco bell tower. When you see it, and not only for the first time, but every times, the only possible thing you can say is WOW! It is absolutely perfect in its beauty, elegance and lightness, due to the refined decoration, the arches, the windows and above all the loggia. Gothic masterpiece, the Doge’s Palace is the result of a series of buildings (the first palace was more of a fortress), demolitions, destructions due to several fires, alterations, additions and renovations that took place since the X century. It hosted: Government, Doge’s Apartments, Courthouse and prisons. After its fall (1797) and the subsequent French and Austrian dominations, Venice became part of Italy in 1866. The Doge’s Palace is too huge to be properly described by a person who’s not a tourist guide nor an art professor. It has too many rooms, decorations and paintings. If I had to explain it in detail, I should write a book and not a simple post. So I’ll try to summarize the highlights, the things I liked most, and those I liked less, the things you should pay attention to and so on. Anyway in every room you will find some panels describing the decorations and indicating the title of every artwork. But do you know who the doge was? The word doge derives from Latin Dux (duke). A doge was the leader of Venice, elected for life by aristocrats, chosen among prominent members of noble families. So, let’s start this journey through history and art and visit this unique Venetian Landmark, The Doge’s Palace. The main entrance is located on the side facing the lagoon. If you have the Museum Pass you can skip the line (info below the post). That’s what I did and I mus say: It is always a pleasure to avoid queues! The first thing you see is the courtyard facing St. Mark’s Basilica (which was once the Doge’s Chapel). The courtyard of the Doge’s Palace is amazingly beautiful in my opinion, with the arches, the marble façade towards the church, the loggias and the “Giants staircase”, former entrance of honour- the name is due to the two big statues on top: Mars and Neptune, sculpted (1565) by Sansovino and representing the power of Venice by land and sea. Then you go up to the Loggias. Along the walls you will notice some horizontal slits, called “bocche di leone” (lion’s mouths), used once to post anonymous complaints or denunciations. Then you arrive at the bottom of the “golden staircase”, whose ceiling is adorned with gold and plaster decorations. It was the staircase leading to the Doge’s Apartments. On a photo below you will see 4 young ladies wearing rubber boots. That’s because that day there was high water in Venice! We decided to enter the Doge’s Apartments first. There was an exhibition going on but we could admire the rich ceilings, the fireplaces, the decorations. The room I liked the most was the Shield one. You will recognize it from the huge maps displayed on the walls. One in particular was very funny. It gave a wrong representation of California and American territories with the writing “Terre incognite d’antropofagi” (unknown anthropophagous lands, i.e. cannibals). 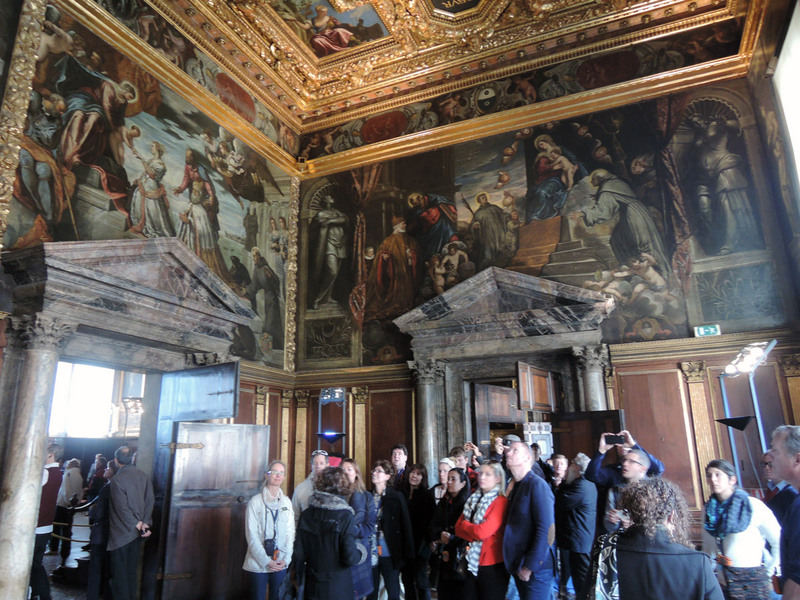 Then you start the long tour of the Doge’s Palace Institutional Chambers: Great Council, Senate, Full Council, etc. 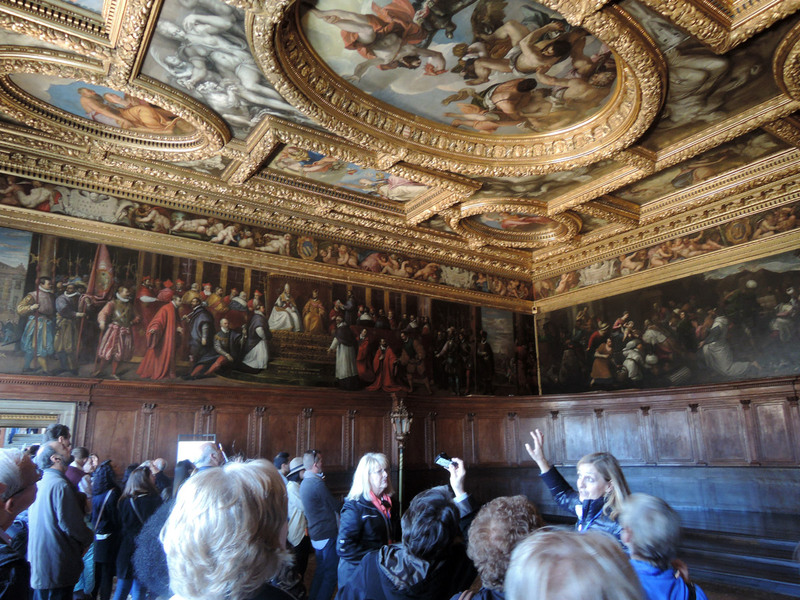 Each room displays a decoration designed to praise Venice government. Four doors room (antechamber) Here, apart from the astonishing ceiling, all adorned by plaster and golden figures, I was amazed by a Titian painting (The Doge Antonio Grimani kneeled in front of the Faith, 1521-23). In the picture below you can also see a man kneeled in front of his girlfriend to take a picture in front of the artwork (so two men kneeled there). The Council Chamber (designed for the meetings of the board of Elders and the Serenissima Signoria, making up the Pien Collegio, Full Council) The ceiling decorations celebrating the Venetian Government are by Veronese. I particularly liked the Tintoretto paintings “Doge Andrea Gritti venerating the Virgin” and “Mystic Marriage of St. Catherine with Doge Francesco Donato”. It is a big hall, lavishly decorated. At this point I was already disoriented. I mean, there are panels explaining the function of each room and listing all the paintings, but the decorations are so many that you can’t possibly know where to look at with more attention. It is impossible to remain focused all the time at the same level at every painting, every ceiling etc. So you may consider joining a tour or simply getting around without the ambition of seeing everything properly. So did I. I took my time to admire the works that seemed better to my eyes, and I didn’t bother too much for the rest. Yes, I looked here and there, I saw everything but I wasn’t exhausted in the end. The Chamber of the Council of Tens (authority entrusted with the State security) displays paintings by Veronese (one is a copy cause the original is at the Louvre). The Armoury is very nice and interesting, even for children. It consists of 2.000 pieces: swords, shields, halberds, crossbows, helmets, guns and much much more, including some strange weapons combining shotgun and sword, or gun and knife. Odd and dangerous! From one of the rooms you can enjoy a beautiful view. Great Council Chamber, where once the aristocracy came to vote new laws or elect members of the government. This hall is gigantic, about 53 x 25 meters per side, and 15 meters high. This significant size is due to the great number of people once composing the Council (between 1.200 and 2.000 members). The paintings are by famous artists such as Tintoretto, Veronese, Palma il Giovane and Bassano. Il Paradiso, the enormous remarkable painting on the right wall as soon as you enter the room is by Tintoretto and his son. The other paintings depict episodes of the Venetian history. Among them I noticed one portraying “Padua (my city) regained” by Palma il Giovane. In fact you can recognise the Saint Anthony Basilica. Another painting that caught my attention was “The Battle of Salvore” by Tintoretto: very ferocious. There was even a man on the foreground with an arrow stuck in his head! Odd fact: Search among the doges portraits and you will notice at some point a depicted black drape. It covers the doge Marin Falier, executed in 1355 for treason (on the wall facing the Paradise painting). All the paintings in this room refer to battles and conquests. The main one is that depicting the Lepanto Battle, considered a crucial victory for the Republic of Venice (sorry, the photo was blurred). In the corridors between the Scrutinio Chamber and the Great Council Chamber you can admire a typical Doge bonnet, called corno ducale (which means ducal horn) and the golden hands once used to count the votes: each voter put a piece of wax (later fabric) called ballotta into the (hence called) ballot box. At this point you can go down to the Prisons (very bare) and the Bridge of Sighs… you’re told you’re inside of it, otherwise you couldn’t tell because it is totally different from what you would expect judging by its external appearance. The bridge was built in 1614 to link the Palace to the Prisons. The sighs refer in fact to those of the prisoners who once entered the prisons and form the bridge glanced at the lagoon for the last time. After the Prisons you pass through a few rooms and then the tour ends up in the bookshop. The tour took us 3 intense hours (stopping, taking pictures, reading the panels) and so we decided to stop and eat at the Culto Café inside the Palace, a bit expensive but not too much for St. Mark’s square. 2 (little) sandwiches, 2 water bottles (500 ml) and 2 fruit salads for about €20. There was no toilet in the Café, you must use those of the Palace. When we went out we found a bit of high water in St. Mark square as you can see in the pics. Beautiful courtyard, staircases, ceilings, paintings, decorations, Armory. It is a must-see, no excuses! Outside the rest-rooms there was so many people queuing that I gave up. Someone complains about the price (18€). Ok, it is not cheap per se. But abroad I paid something like 6€ for things like a Clock Museum or a Christmas Museum… I think a unique masterpiece of art and history like this is well worth 18€! Isn’t it? Especially with a combined ticket. Anothe one writes that there are different tickets that give access to different areas of the palace. ??? I had the Museum Pass, I skipped the queue and I visited the entire Palace, including Prisons and Doge Apartments. Dunno! If she refers to Secret Itineraries well, it is a totally different story, I think. Someone else complains that backpacks are not allowed. What do you expect? I had to leave my precioussssss purse at the Neue Pinakothek in Munchen for example. I had to visit it without water, without my belongings and put everything I could into my small jeans pockets to carry with me my ventolin for asthma, and you expect to enter the Doge Palace which is full of visitors and inestimable artworks with a backpack? My husband left his backpack without resisting. As for me, no one asked me to abandon my purse! Hurray! St. Mark’s Square Museum Ticket 18€ full, 11€ reduced. A single ticket valid for the Doge’s Palace and the combined itinerary of Museo Correr, Museo Archeologico Nazionale and Monumental Rooms of the Biblioteca Nazionale Marciana. Regular visit is fully accessible. Secret Itineraries, Prisons and Armoury are not accessible.